In September of 2016 the Mississaugas of the Credit First Nation filed an Aboriginal Title Claim to Waters within the Traditional Lands of the Mississaugas of the New Credit. Our people continue to revere water as a spiritual being that must be accorded respect and dignity. Water is also vital to the survival of the Mississaugas of the Credit First Nation and all other forms of life. As stewards of the lands and waters, we advocate for a healthy environment for the people and wildlife that live within our treaty lands and territory. The Mississaugas of the Credit First Nation remains committed, as we have been for generations, to utilizing, protecting and caring for the waters in a holistic way that promotes continued sustainability. We want to maintain and strengthen positive relationships with the people who share our treaty lands and territory. 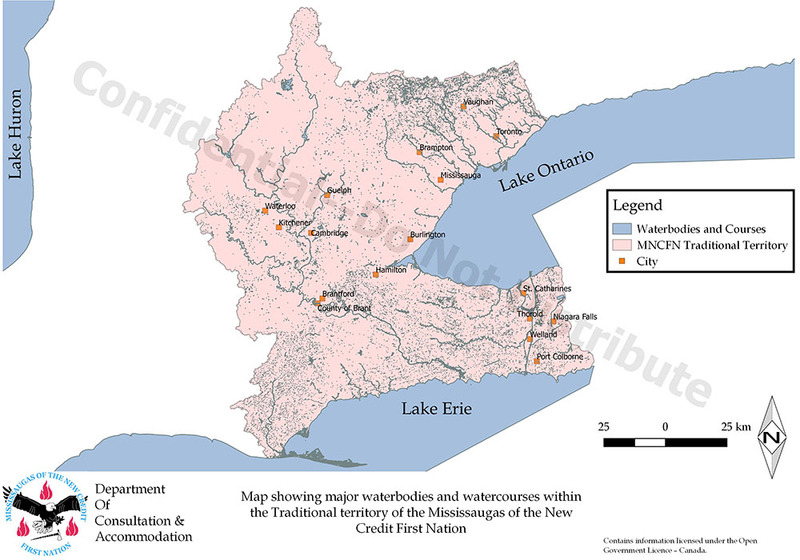 The Mississaugas of the Credit First Nation asserts that we have unextinguished Aboriginal title to all water, beds of water, and floodplains contained in our 3.9 million acres of treaty lands and territory. There is no mention of water in any of the treaties between the Mississaugas of the Credit First Nation and the crown but for surrender #23 which we allege is invalid. Click here to view the Aboriginal Title Claim to Waters within the Traditional Lands of the Mississaugas of the New Credit.